Ned and his brother are both products of American Hashomer Hatza’ir inculcation and both remain radically tied to that pro-forma Zionist-Marxist youth movement (even though both are now thirty-something). They seem unable to outgrow the evidently addictive juvenile connection. Both brothers lived in American communes and both thrive on political activism. There’s almost no radical cause which they hadn’t passionately espoused, even that of the Mavi Marmara. For years they paid sporadic visits to Arab communities in and outside our Green Line and they waxed positively ecstatic over last year’s camp-in at Tel Aviv’s Rothschild Boulevard. It wasn’t long afterwards that the Occupy Movement began springing up, initially on Wall Street, from whence it spread to other urban centers. The brothers were there, very confrontationally there. Are they or their ilk the invisible link between our 2011 summertime protests and what later sprang up elsewhere? Who knows? Maybe. Then Ned, whose Hebrew is rudimentary, announced that he’s “making aliya.” This meant a shared pad in Tel Aviv’s hip Florentin Quarter, frequent trips to Jenin, participation in almost every trendy demonstration or flashpoint of contention. Ned protested Kadima’s joining the coalition, hotly supported the Hamas prisoners’ hunger strike, equally hotly opposed JNF tree-planting near Beduin communities, decried a projected eviction of Arabs in Silwan and celebrated its foiling, marched in Tel Aviv on May Day, protested on behalf of illegal African infiltrators, demanded the unconditional razing of disputed apartment houses on Givat Ha’ulpana, protested Jewish residence in Jerusalem’s Beit Hanina, agitated against “racist and thieving settlers,” partook in the latest attempts to revive the social protests, and much, much, much more. The list is long. That seemingly is all that Ned does in Israel. He’s an aging professional youth movement stalwart who has made it his mission to enlighten us benighted natives and change our evil ways. The irony is that the useful idiots who dance to the tunes of shadowy political pied pipers like Ned couldn’t be more petite bourgeois. Their disaffection arises from the conviction that expensive Nespresso machines are a must in every suitably chic kitchen, that ski trips aboard are the birthright of every Israeli seeking to escape our arid climes, that other taxpayers need subsidize luxurious tastes and spendthrift lifestyles to which all nouveau-riche wannabes are entitled. Do the useful idiots know that Ned and fellow “social protesters” attended alternative Remembrance Day ceremonies in which fallen terrorists (a.k.a. suicide-bombers) were also mourned? Probably not. Do they know that on his website meddlesome Ned describes himself as “striving for global justice and equality?” Do they stop to ponder what the phrase means? Do they at all attempt to put it into any sort of historical context? If they could at all contextualize, they’d instantly associate Ned’s “global justice” with the battle for “justice and legality” waged by this country’s pre-independence militant Left. The similarities are quite striking. Husseini subsequently, in the role of pan-Arab prime minister, spent the war years in Berlin, where he hobnobbed with Hitler, Himmler, Eichmann, et al. He broadcast virulent Nazi propaganda, recruited Muslims to the SS and actively foiled the rescue of any Jews, even children, during the Holocaust. The anti-Zionism of the PKP evolved gradually. The party arose from the fringes of the mainstream Poalei Zion. In 1919 it banded as the Hebrew Socialist Workers Party. But by 1922 its rejection of Zionism became so pronounced that it ditched Hebrew – whose revival was core to the Zionist ethos – and reverted to Yiddish. In 1923, the PKP castigated Zionism as “a bourgeois movement serving the interests of British imperialism” (just as the Zionist state today is castigated for purportedly serving the interests of alleged American imperialism). The party cheered the 1939 Molotov-Ribbentrop pact that facilitated WWII. The PKP vehemently opposed fighting the Third Reich until Hitler betrayed Stalin and attacked the USSR in 1941. Ned, of course, would stress that pro forma he’s no communist and that his now-diminutive Hashomer Hatza’ir regards itself as Zionist. The trouble is that distinctions which mattered hugely in the 1930s no longer matter much. The big picture is that of a radical Left which undercuts the Jews of this country, whether back in the days of the embryonic Jewish state or in today’s extant Jewish state, whose struggle to survive still continues. Sovereign Israel is still menaced by descendents and torchbearers of the mufti’s original pro-Nazi adherents and it still faces unabated threats of genocide or ethnic cleansing. The enemy, now as then, still bays for our blood, while posing as the downtrodden victim of grasping wily Jewish forces. It’s this duplicitous Arab strategy which begat the Nakba that Ned so bewails. Israel’s cardinal sin was having dared spoil Arab plans for its annihilation. Because Israel impudently remained alive (and kicking), its survival is denigrated as a cataclysmic misfortune. The very assertion that the Nakba resulted wantonly out of the blue from Israel’s birth in 1948 is malevolent distortion. The conflict didn’t begin in 1948 – it reached its culmination then. The Arabs violently combated the Jewish community which existed in this country pre-WWII and was ripe for statehood before the Holocaust. 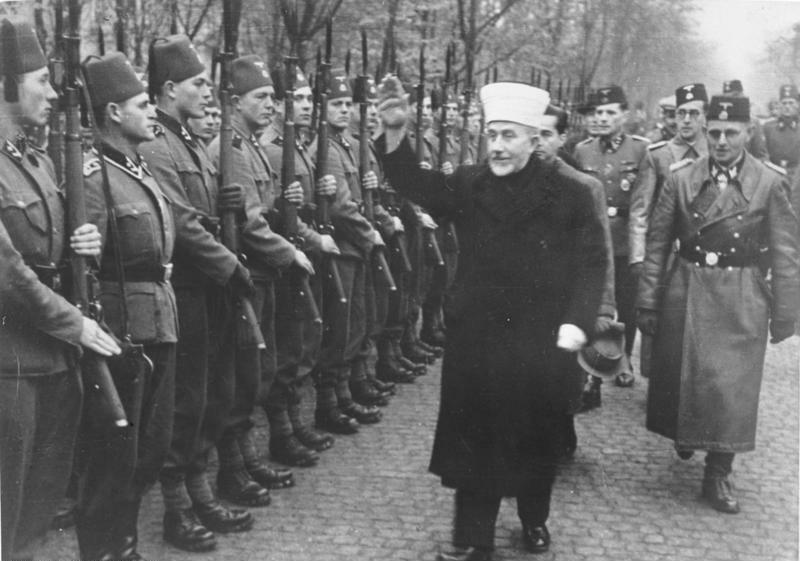 The mufti’s carnage delayed Jewish independence. The Arabs denied asylum here to desperate Jewish refugees from Hitler’s hell, thereby dooming them to death. The blood of these exterminated Jews permanently stains Arab hands. The war which the entire Arab world launched against newborn Israel, three years post-Holocaust, was with explicit blusterous braggadocio (and the help of recruited European ex-SS henchmen) geared to complete Hitler’s mission. Murderous Arab rampages greeted the November 29, 1947, UN General Assembly Partition Resolution. Its objective was to divide this tiny land into a Palestinian Arab state and a pitifully puny, terrifyingly vulnerable Jewish counterpart (wedged mainly along the coastal highway between Tel Aviv and Netanya). The Arabs set out to thwart the implementation of the UN decision. Now they pose as the hapless victims of the war they launched, pretending that all they ever wanted was a two-state solution. They lost their own war and, ever since, are consumed by the festering rage of having failed to eradicate us. What they call “occupation” doesn’t only relate to the territories that came under Israeli control in 1967. Occupation also – and principally – refers to the territories that constitute Israel since 1948. In other words, all of Israel is illegitimate. Israel’s very existence is unacceptable. No Jews should be here. And this is what gravely gullible Ned and fellow overly idealistic Jewish fanatics of the last vestiges of the lost Marxist cause (by whichever name it parades) refuse to acknowledge. They, who lure their own sub-set of useful idiots, are foremost themselves useful idiots in the service of the mufti’s latter-day disciples (by whichever name they parade). Nobody knows better than the volatile incited Arab masses how to collectively fly off the handle in an orchestrated display of premeditated pseudo-righteous indignation. And my cousin falls for their lament of the fact that we at all live. about my cousin the lesbian “priestess” of some whacked out religious cult. These leftist sickos are mind-boggling…but one thing is for sure: Enemies are just enemies, no matter of their background or descent…and they should ALL be treated equally ! The fight for Israels political and therefore physical survival is not a childs play…! At some point the useful idiots always become useless idiots to the prince of darkness they serve and are summarily dispatched to the netherworld by their master. I do seriously believe that the they will all soon meet the same fate that sprang up so shockingly and instantaneously upon the early Jewish trouble makers Dathan and Abiram, only this time their destruction will come from the sky. My heart is not with Hashomer Hatza’ir, American or else. A very close relative and beloved US born teen, who holds dual Israeli-US citizenship visited Israel a couple of years ago, with a whole bunch of similar teens, within the framework of a trip organized by American Hashomer Hatza’ir, and paid for by the youths’ parents. I kept as close a contact as possible with the teen, should she need something. This brought me in contact with the other youths and their counselors. I didn’t grill them on their political opinions, they didn’t seem to have any. They were just immensely curious and delighted to be here. I didn’t feel they were subjected to any kind of political indoctrination hostile to Israel and Zionism. If I had felt that any such indoctrination had been, or was, or would be exerted on the youths, I wouldn’t have hesitated to forcefully warn the parents, and that’s an understatement. This is an excellent article that explores the history of Israel and the politics of antisemitism. But you might have touched on the history of the relationship between the Israeli left and labor. You go into a little detail about the fact that your cousin exists materially in a rather magical way. The means of his support are mysterious or not available for examination. But the only real vitality the left and the communists have ever had were in terms of labor and the economy. The economic history of Israel also includes contributions made by socialists whose conviction that Israel had to be built with Jewish labor carried Israel to the self sustaining economy that it is today. In the end, capitalism had to have a place too, first to accomodate the economy of Jews who already lived in the area before Zionism and also to create a place for money to go where Jews abroad sought to make contributions to the reborn country’s economy. Even donations had to have a place to go and the government wasn’t really the place to accept them. The self-identified Jewish labor movement was always a blow to the antisemitic propoganda that Jews were parasites that fed off the working classes by controlling the economy. The prison ghettos of the Third Reich were sadistic displays that were supposed to demonstrate how Jews could not survive without some kind of economic host. The economic rise of Israel under Jewish labor was a clear demonstration that this could not be true. Very interesting article about how the left is at best, indifferent to the fate of Israel; as seen through the eyes of Ms. Honig’s neer-do-well OWS cousin, Ned. So in present-day Israel the struggle is between successful bread-winners, and the OWS types, on society’s fringes. But was it always this way? Menachem Begin was Israel’s first non-socialist P.M., in 1977. Were there as many neer-do-well OWS types before then, as there are today? Don’t think so. But one question won’t go away. Is there a way to give Israel’s Prime Minister the power to appoint judges to the Israeli Supreme Court? …and by the way, Ms.Honig’s columns, taken together, are as informative as Abram Sachar’s History of Israel. Sarah, thank you for being so open about your own,I’m sure it hurts. “The Arabs denied asylum here to desperate Jewish refugees from Hitler’s hell, thereby dooming them to death. The blood of these exterminated Jews permanently stains Arab hands.” This is the most cogent of your statements. This point applies also to the leftists who supported them, and to the British who assisted them. It will all break open like a rotten egg one day. There are few secrets here. It was all out in the open. All that remains is the courage of the interpretation.